Teachers take care of our precious little (and big) ones. They make them smarter and help them grow. There are some special occasions when we simply want to tell them "THANK YOU!" and to show them our appreciation. At the same time we need to remember that teachers' gifts should be small and modest due to the nature of their job and to school ethics. Teacher survival kit is the perfect gift for your child's teacher – it is small and inexpensive, it shows your appreciation and it reminds the teacher why he/she chose to be a teacher. Teacher survival kit is made out of cheap little items that are practical and/or symbolic. Attach a little note to each item and put all of them in a nice bag or a box. Meditation CD - to use when the noise is too overwhelming (it might relax the students too). Chinese Fortune Cookie – to remind you that your students are very fortunate to have you as their teacher. Scratch Off Lottery Ticket – to remind you how lucky you are to have such a rewarding job. Matches – for the fire you light in your students' eyes. Disposable Camera – so you can perpetuate precious memories. Batteries – to give you energy and to help you keep going and going and going. Coffee Shop Gift Card – to give you a boost of energy on rough mornings. Smiley Faces Stickers – to remind you to wear a smile – "Smile and the world will smile with you" (and to remind you that all of us have our days – even your students). "Good Work" Stamps – for letting you know what a good job you are doing and for reminding you to encourage your students whenever they are doing a good job. Permanent Markers – to thank you for the good (and permanent) influence you have on our kids. And Erasable Markers – to remind you that everyone makes mistakes and that (almost) all of them can be erased or fixed. Seeds – to remind you that you're planting the seeds for the future. A Mug – to use when yours is overflowing. Clay / Das / Play dough – to remind you that you are forming other peoples' lives. Gold Chocolate coins - to remind you that you're already one of the richest people on earth. Helium Balloon – to thank you for making our child believe he can reach the sky if he wanted to. Highlighter - because you are the high-light of my child's day. For many more ideas of what to put in a teacher survival kit click here. Here is an idea for a lovely container for your teacher survival kit. 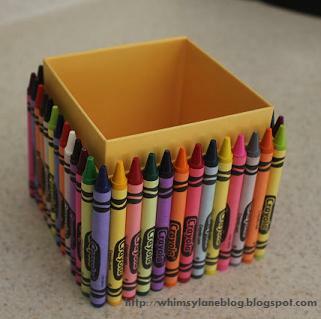 Find a nice box and glue crayons around it with hot glue gun. You can organize the crayons according to their color and shade - from the darkest to the brightest. Click on the photo for a short "How to" by my friend Lauren - Thank you Lauren! Don’t forget to add a personal "Thank You" note to your gift! Teachers appreciate these notes. Ten years ago I've worked with 7th graders and got a thank you note from one of the parents – I still have it! Are You Planning To Make A Survival Kit for Your Child's Teacher? I assume that you know your child's teacher a little bit so I think you will have no problem to come up with some cool ideas. When you are done making fun survival kits for your kid's teachers come here and brag a little. Upload a photo or two and share your ideas. Liz (Australia) - Loved the idea! I'm definitely going to use it this Teacher's Day. A candle to remind you that You are a light in my child's life. A hand lotion to thank you for a smooth year. Dominique (Canada) - Un-popped bags of microwave popcorn with a note about just popping over to say Thank-You or about thanking her for being so popular among my child and his friends.